Olivia Lum, chief executive of Hyflux, and Anthoni Salim, chairman of the Salim Group, at a signing ceremony on Oct 18, 2018. Prime Minister Lee Hsien Loong at the opening of Tuaspring on Sept 18, 2013. Beside him is Hyflux executive chairman Olivia Lum. IT was supposed to be Hyflux's springboard into the integrated water and power project segment. But the Tuaspring water desalination plant, which Hyflux chose to append with a power generation plant, turned out to be the membrane technology firm's toughest project of all. The Business Times tracks that journey. January 2001: Hyflux raises net proceeds of S$6.8 million in an initial public offering. January 2003: Temasek Holdings invests S$11.8 million for a 4.76 per cent stake in Hyflux. March 2005: Temasek reduces its stake to 0.89 per cent. By 2006, it is no longer on the list of Hyflux's top 20 shareholders. June 2010: PUB calls a tender for Singapore's second and largest desalination plant to be built at Tuas. October 2010: Tender closes with nine bids received. Hyflux put in the most competitive bid, offering to supply water at a first-year price of $0.45 per cubic metre. Keppel Seghers offered a first-year tariff of S$0.67 per cubic metre. Sembcorp Utilities offered a first-year tariff of S$1.42 per cubic metre. January: Hyflux issues S$55 million 3.89 per cent Series 006 notes due Jan 2016. March: Hyflux wins the PUB tender. To "enhance the operational cost-efficiency", Hyflux says it will build a 411 MW power plant to generate its own power on-site for the desalting process. Excess power will be sold to the power grid. The stated project cost is S$890 million. It is Hyflux's largest contract, and first foray into power. "The technical and financial viability of this proposed model was validated and approved by various parties, including regulators, professional advisors and project finance lenders." April 6: Signing of Water Purchase Agreement (WPA) with PUB. Tuaspring is required to deliver up to 70 million gallons of desalinated water per day to PUB over a 25-year period from 2013 to 2038. April 25: Hyflux issues S$400 million, 6 per cent perpetual preference shares. It is the first non-bank in Singapore to do so. Retail investors are allocated S$200 million. Investors who are Central Provident Fund (CPF) members could use up to 35 per cent of their investible savings to apply. Private banks are allocated more than 70 per cent of the S$190 million placement tranche. Hyflux's directors, management and employees are allocated S$10 million under the reserve offer. DBS Bank is the sole lead manager and bookrunner. Net proceeds are used to fund Tuaspring. April 26: The preference shares surge as much as 3.1 per cent to $103.10 during their debut on the Singapore Exchange. July 2011: Construction of the Tuaspring Integrated Water and Power Project begins. July-September: Hyflux issues S$100 million 3.5 per cent Series 007 notes due July 2016. Hyflux issues S$100 million 4.25 per cent Series 008 notes due Sept 2018. Hyflux issues S$65 million 4.6 per cent Series 009 notes due Sept 2019. May 3: Hyflux seeks PUB's approval to revise project cost for Tuaspring up from S$890 million to S$1.05 billion. The cost increase of 18 per cent arises from Hyflux's choice of a higher-efficiency power plant. August: Hyflux issues S$100 million 4.2 per cent Series 010 notes due Aug 2019. Sept 18: Prime Minister Lee Hsien Loong officiates the opening of Tuaspring desalination plant. The desalination plant delivers first water but the power plant is not yet operational. Hyflux secures a S$720 million 18-year term loan facility to fund the development of the desalination and power plants from Maybank Singapore and Maybank Kim Eng Securities. Jan 23: Hyflux issues S$300 million 5.75 per cent perpetuals, for institutional and accredited investors only. May 8: Hyflux reports first delay in connecting Tuaspring to the national power grid. July 29: Hyflux issues S$175 million 4.8 per cent perpetuals, for institutional and accredited investors only. January: Hyflux seeks consent to loosen financial covenants for Series 006 to 010 notes. August: Tuaspring power plant is connected to the national grid in the second half of 2015 after a period of prolonged delay. Feb 18: Hyflux has started selling electricity to the grid. But it notes: "In the near term, the electricity market in Singapore is expected to be challenging due to the current market landscape." Hyflux plans to grow consumer water segment for steady recurring income. May 27: Hyflux issues S$500 million 6 per cent perpetuals, for the purpose of redeeming the S$475 million perps earlier issued to accredited investors. In view of strong interest from retail investors, the size of the public offer is increased from S$115 million to S$329 million. Hyflux's directors, management and employees are allocated S$6 million and the remaining S$165 million is placed out. DBS is the sole lead manager and bookrunner. July 29: Hyflux redeems all S$175 million 4.8 per cent perps two years after they were issued to accredited investors. Jan 23: Hyflux redeems all S$300 million 5.75 per cent perps three years after they were issued to accredited investors. Feb 23: Tuaspring fails to turn a profit. Hyflux says it will partially divest Tuaspring, subject to regulatory approvals. Dec 28: Hyflux proposes a dividend in specie to spin-off 70 per cent of the consumer business. Hyflux shareholders will receive one Hyfluxshop share for every 10 Hyflux shares. Hyflux fails to divest Tuaspring by the end of 2017, as earlier planned. Jan 17: Ms Lum offers to buy the Hyfluxshop shares for 17.83 Singapore cents per share. Feb 15: Dividend in specie is completed, Hyflux owns 30.4 per cent of HyfluxShop shares. Feb 27: Hyflux says S$400 million pref shares won't be redeemed until Tuaspring is divested. Tuaspring posted a net loss of S$81.9 million in 2017, with Singapore wholesale electricity prices clearing at levels that are below fuel costs (negative spark spreads) when dispatched by power generation companies to the national power grid. "The last thing we want is a fire sale. We believe that we have a good asset, we have a good track record, still have a brand name. Why are we cornered? We know what we are doing. We have no shortage of interested parties talking to us." March 22: KPMG signs off on Hyflux's audit report, having concluded that there were no events that cast significant doubt on Hyflux's going concern assumption. April 25: Hyflux pays a 6 per cent coupon but does not redeem its S$400 million 6 per cent pref shares at the call date. Coupon rate steps up to 8 per cent per annum. May 22: Hyflux files for bankruptcy protection and gets an automatic 30-day moratorium. Trading in all its shares and securities is suspended. "After losing two years on the power business, the lenders became more jittery and they started to kind of not support us in other unrelated businesses... Maybank was becoming a little bit impatient with us. They wanted to force sale this project, that's why we entered into a moratorium." May 27: Hyflux fails to pay a coupon on its $500 million 6 per cent perps, resulting in an event of default. June 19: A Singapore High Court extends Hyflux's debt moratorium by six months, or until Dec 18, 2018. Oct 12: Out of eight interested parties, only Keppel Corp and Sembcorp Industries were prequalified by PUB to bid for Tuaspring, and only Sembcorp actually submitted a bid. Sembcorp's offer was reportedly below Tuaspring's book value and not enough to fully pay back Maybank's S$518 million secured debt. "The problem with Tuaspring is it's a strategic asset. Every name that comes through the door has to be approved first. It takes a long time. Some of these companies are overseas companies. PUB must know who they are before they come into the dataroom." Oct 18: Indonesian conglomerate Salim Group and energy giant Medco Group agree to give Hyflux a S$400 million equity injection, in exchange for a 60 per cent stake in the water treatment firm once all its debts are extinguished. The consortium, SM Investments, will also grant Hyflux a shareholder's loan of S$130 million. 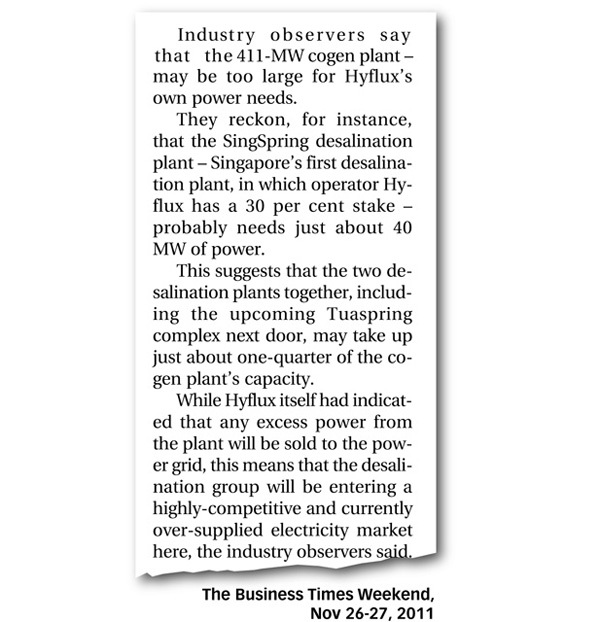 SMI wants to buy Hyflux with all assets intact, so the sale of Tuaspring is called off. SMI was picked by Hyflux from an initial pool of 16 potential investors. "Today is a happy day... We will leave it to all the experts to work out a plan." Nov 26: A Singapore High Court extends Hyflux's debt moratorium by four-and-a-half months to April 30, 2019. Jan 18: Hyflux warns that retail perp and pref share holders will get nothing in liquidation. In a liquidation scenario, only senior unsecured creditors, namely banks and note holders, will get paid. They can expect a recovery rate of 3.8 to 8.7 per cent, according to EY's calculations. "With SM Investments coming into the company, this is effectively a takeover and I no longer will own much shares, in fact almost no shares. So I will no longer be in the driving seat... I know many people do not like to see my face anymore. I'm ok, I'm prepared to step down." Feb 16: Hyflux releases its proposed rescue plan. Retail perp and pref holders are offered an implied recovery rate of 10.7 per cent on their original S$900 million investment, comprising a cash recovery of 3 per cent and 7.7 per cent implied equity value. Ms Lum and her board of directors say they will forfeit their shares in Hyflux as well as what little entitlements they have from the debt securities they own, in favour of small investors. Hyflux's senior unsecured creditors, comprising medium-term note holders owed S$271 million and unsecured banks owed S$717 million, can expect a minimum recovery rate of 24.7 per cent. March 1: Hyflux takes a S$824 million impairment on Tuaspring for the period ended Sept 30 last year. It says that the huge difference from 2016, when the last valuation was done, is due to losses in the electricity market in recent years and lower projected spark spreads for the remaining concession period. March 5: PUB serves a default notice to Tuaspring Pte Ltd for failing to keep the plant reliably operational, and failing to produce financial proof that the plant can be kept running for the next six months. The operational issues date back to early 2017, PUB said. Tuaspring was unable to replace poor-performing membranes promptly, which affected the quantity and quality of water produced. It also failed to supply PUB with 70 million gallons of desalinated water per day on numerous occasions. PUB has a right to terminate the WPA and take control of the plant if the defaults are not remedied by April 5. March 8: Hyflux amends its scheme to be more equitable to perp and pref holders. March 18: Salim-Medco says it reserves the right to pull the plug on the rescue plan, if Tuaspring's operational and financial defaults are not remedied by April 1. March 21: PUB says that if the WPA is terminated, it will take control only of Tuaspring's desalination plant, and not its power plant, which sits on the same site. This transfer will occur at zero cost to Hyflux, even though the desalination plant is expected to have negative value, based on calculations done in accordance with the WPA. PUB is willing to waive the compensation sum, given Tuaspring's financial position. The water plant is determined to have negative value because PUB is entitled to recover the cost of restoring the plant to good operating condition from the concession company. The projected costs also take into account the burden PUB has to shoulder to maintain and run the plant. Hyflux says that it has reached out to SMI, but acknowledges that SMI has no obligation to vary the restructuring agreement. "Hyflux itself has noted that PUB's actions... would be favourable to Tuaspring Pte Ltd, as this alleviates the pressure on the rest of the Hyflux Group... This will also increase the chances of Hyflux being successfully restructured. PUB's actions should therefore not be used as the basis for SMI's decision to withdraw from the restructuring agreement." April 5: Scheme meetings to vote for Salim-Medco deal, or liquidation. If Tuaspring does not cure its defaults by April 5, PUB can terminate the WPA by giving 30 days' notice to Tuaspring, after which it will take over the water plant. The decision to build Tuaspring as a cogen plant was a business decision undertaken by Hyflux itself. PUB had never asked Hyflux to do so. Hyflux's plan was to subsidise the low water tariffs (first-year price of S$0.45 per cubic m) promised to PUB by generating excess electricity that it would sell to the national grid. "That's how they painted themselves into a corner when wholesale electricity prices collapsed," says Carey Wong, a former analyst covering Hyflux who is now a portfolio manager at Ascend Capital Group. "Future year tariffs would follow first the year's tariff, adjusted for inflation, that's generally how water tariff contracts work." For comparison, the first-year water tariff for SingSpring, which opened in 2005, was S$0.78 per cubic m. The first-year price for Keppel's plant in Marina East, set to open in 2020, is $1.08 per cubic m. Ms Lum said last year that desalinated water only accounts for 10 per cent of Tuaspring's revenue: "If you lose money on the power plant, that means 90 per cent of the revenue. You've lost money on the whole project." Wholesale electricity prices, known as the Uniform Singapore Energy Price (USEP), hit an all-time high of S$222.6 per MWh in 2012, before falling to an all-time low of S$63.2 per MWh in 2016. The utilisation rate for the Tuaspring desalination plant would be 10 per cent/ 50 per cent/ 100 per cent during 70 per cent/ 20 per cent/ 10 per cent of the time, Hyflux said. These initial offtake figures were reported by JP Morgan in 2011. Desalinated water is more costly than NEWater or imported water, since desalination is an energy-intensive process. So Tuaspring typically runs at full capacity only in dry seasons. "It's actually not up to you to maximise the utilisation because PUB decides how much water it wants to take," explains Carey Wong. "The government plans ahead, so they always build ahead. Tuaspring is supposed to be a 25-year contract so the 318,500 cubic metres capacity is for the next 25 years, not to meet immediate requirements."